We meet for a Play Day occasionally. Check the calendar above for scheduled play days or join the Facebook group for the latest information. We start between 9:00 and 10:00 am at Walnut Hill Park. Bring a chair or you can sit on one of the park benches. Remember to bring plastic baggies to pick up doggie poop. Be prepared to keep your dogs on leash or in a crate (when not chasing down discs). As friendly to people as most of our dogs are, they are not always friendly to each other. Check here for the latest announcements. Join Dallas Dog Disc Club on Facebook. Keep up with regional and national happenings. 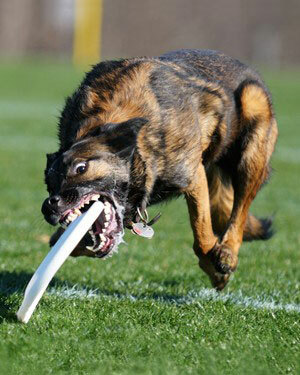 Join Disc Dog Discussions on Facebook. The Dallas Dog & Disc Club is a group of disc dog fanatics who get together regularly to have fun while promoting canine disc as a great way to keep our dogs happy and healthy. Our activities include informal play days where members and visitors exchange training tips, demonstrations for schools and community events, and competitions for everyone from the beginner to the world finalist. Demos? - Yes! The DDDC is available! We do numerous disc dog demonstrations each year for worthy animal causes/events in and around the DFW area. If you are a city related organization, all we ask for in return for our dynamic show is the opportunity to use one of your parks for a structured playday and/or competition. We also accept donations. Please contact us for more information.